I'm very excited to announce that Introverts in the Church is now available for pre-order on Amazon.com!! As I said in a previous post, Amazon pre-orders are very important for wide distribution of the book, as other booksellers will use the number of pre-orders there to determine how many copies to order initially. The more Amazon pre-orders, the more likely it is the book will appear in your local Barnes and Noble and Christian bookstore. So please consider pre-ordering and telling others to do the same! It's been fun to see people linking to the book on their blogs and on Twitter and Facebook. There are SO many people out there who resonate with the topic. Introverts are called and gifted by God. 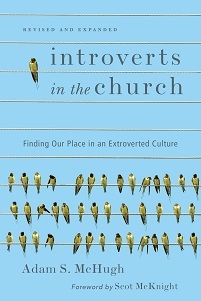 But many churches tend to be extroverted places where introverts are marginalized. Some Christians end up feeling like it's not as faithful to be an introvert. Adam McHugh shows how introverts can live and minister in ways consistent with their personalities. He explains how introverts and extroverts process information and approach relationships differently and how introverts can practice Christian spirituality in ways that fit who they are. With practical illustrations from church and parachurch contexts, McHugh offers ways for introverts to serve, lead, worship and even evangelize effectively. Introverts in the Church is essential reading for any introvert who has ever felt out of place, as well as for church leaders who want to make their churches more welcoming to introverts. Discover God's call and empowering to thrive as an introvert, for the sake of the church and kingdom. 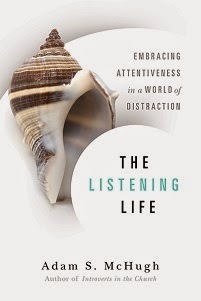 "What a timely and badly needed book! Introverts in the Church will encourage thousands of Christians who have felt as if they don't quite fit. It will help them find their rightful place in Christian community, so that their gifts might be well used in the work of the kingdom. This book will also help churches to be a place where all people can flourish as disciples of Jesus. Adam McHugh has given us a precious gift through his openness, theological soundness and godly wisdom." "This is a book that all leaders in the church should read! It made me realize that I owe an apology to all the introverts whose insights and contributions I have not understood or have overlooked. McHugh's perceptions are crucial for churches in our extremely extroverted society--we are missing some of God's best treasures for Christ's body. I highly recommend this book to everyone who wishes more thoroughly to understand the Holy Spirit's creation of a diversity of personalities and gifts." "Introverts, take heart! As an introvert myself--an off-the-chart 'I' on the Myers-Briggs--I find certain aspects of church life, like speaking to other human beings every Sunday, really taxing. McHugh thoughtfully explores the gifts introverts bring to the church, and he considers both how introverts can live well in the church and how churches can be more hospitable to us." "As a fellow introvert, I well know the tension, irony and even contradiction of being in vocational ministry where public speaking and being with people are major and vital parts of our roles. This book puts together extremely helpful thinking to better understand who we are and how to navigate and celebrate being introverted and in leadership in an extroverted world." "For the longest time, I've considered my wiring as an introvert a thorn in my side. After spending time engaging with others, I felt so empty and overwhelmed . . . and lonely. With my calling as an author and pastor requiring me to publicly speak and consult, I wondered if I misunderstood my place in this world. In Introverts in the Church, Adam brings a voice to those of us who often trade ours in for a little bit of respite. This is not only a needed resource for introverts; all leaders need to read Introverts in the Church for a better understanding of how introverts can lead, how they follow and how they refresh." I've wondered for a while what the personality demographics are of people on twitter. Here's an unscientific, but very interesting survey of the MBTI personality temperaments of people on twitter. A quick preview: introverts far exceed extroverts in twittering, and the most common profile is INFP.